Do not call it Interbike Lite. DealerCamp – an intimate gathering of bike manufacturers, parts suppliers, bike shop owners and industry geeks – is anything but Interbike. Though meeting at the swanky Deer Valley Resort, DealerCamp features a low-key, relaxed vibe that offers an opportunity to truly explore bikes, products and trends without the chaos that inherently comes with Las Vegas. And Demo Day? The entire event is one giant demo day with group rides, lift passes, product sampling and honest-to-goodness testing that brings dealers and vendors together. DealerCamp visited Deer Valley for a three-day run from July 24-26, 2012, bringing dozens of exhibitors and hundreds of dealers together for up close and personal industry chit-chat. Camisasca said after rapid growth from Year One in 2010 to 2011, DealerCamp is a bit smaller in 2012 – but by design. But while the trade show portion of the event might be a little smaller, the feel and energy is alive and well. With a mid-summer cyclocross race sponsored by Raleigh – a major exhibitor at DealerCamp – the first day of the show was punctuated with some incredible action as some of the biggest names in the sport dusted off their cross legs to race for a hefty prize purse and, for some, a professional contract with Raleigh-Clement Cycling’s cyclocross team. A solid mixture of large and small exhibitors made their way to Deer Valley to pitch their goods. Shimano, Scott and Cannondale each had a sizeable presence. So, too, did small-scale companies hoping to carve a niche in the bike industry. Volagi, fresh off a difficult court battle with Specialized, had a spot reserved in the middle of the show to display it’s patented Liscio frame with LongBow Flex stays. They also brought along their stylish steel frame bike, the Viaje. Robert Choi, co-founder of Volagi, said he was at DealerCamp to establish relationships with dealers from around the country and give them a better opportunity to check out his bikes in a way a crowded convention floor can’t typically provide. Also on site were recognizable brands such as Louis Garneau and GU Energy as well as smaller or newer exhibitors such as SeaSucker bike racks and Honey Stinger nutritional products. Giving the industry a chance to gather earlier in the product cycle was important for Camisasca. Camisasca said plans for 2013 are already being made with Deer Valley fully onboard as a host location. With lessons learned about growing the event too fast, Camisasca said he hopes for slower growth each year as the trade show attracts more exhibitors, more dealers and more media. Dealer Camp and its cousin Press Camp are part of a number of industry mini bike industry trade shows that were hosted in Utah this year. Other companies that brought dealers to Utah to sample great trail and road riding and to see their wares include Specialized, Quality Bike Parts, Raleigh, and Cannondale. 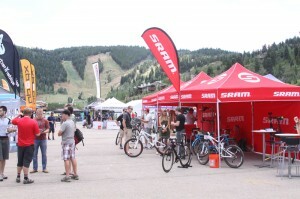 Specialized held their annual dealer show at Snowbird this year, while QBP held their annual Saddle Drive event at Snowbasin. These shows bring dollars to Utah and showcase Utah’s ranking as a great place to ride.